- Precision engineering, ergonomic design and a detailed fusion of features deliver maximum aeronautical authenticity. First of all I`ve upgraded this from Saiteks own X45. 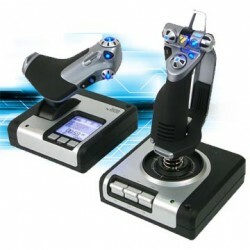 Now if you`ve ever used this hotas system your probably aware of its shortcomings. Yes its `value for money` but in all honesty its faults were a little too niggly. These were the creaking and groaning noises when actually moving the stick. Small movements werent that easy. Stick was quite large for my hands - I know people have said its too small (!) but I have small hands, so the buttons were uncomfortable. So - easist thing to do is to say what the X52 does best and its main features. * New styling with Blue glowing buttons - buttons moved into better positions - much better feel. * Rudder control has now gone from throttle onto stick - not a problem for me - this can be locked tho and peddles used instead ? * The Smoothness of the thing is outstanding ! - no groans - movement is soft and very comfortable. * Button position is better. * MFD (multi function display) is cool looking. Not a great use to me but it displays the profile your using - clock - and which button is pressed. More importantly you can create different profiles for different aircraft - excellent ! and change them on the fly. * Is not that bad to look at - the pictures show a space age toy - it looks better in the plastic - or should that be the various materials used. They are metal and plastic and feel very solid and well made. All in all theres no comparison between this and the X45 - if you can change, change it. Best purchase I`ve bought in a stick and great price. Anybody has specific questions feel free to email me. Other than the cost of it, I am very pleased! Pros: Very nicely weighted controls, superb build quality, easy to set up. Cons: Possibly too many buttons and no force feedback. I bought this joystick to replace my dead Ms Sidewinder 2 and I must say it's worth the cost of purchase. The weight of the controls just feels right, not too heavy or too light. The joystick features loads of buttons, possibly too many for my needs. I paid £68 for mine from www.aria.co.uk. Overall, a very good joystick and worthy of a thumbsup from me. It's definetly my favorite joystick ever. Bought it to to replace a Logitech 2.4 Cordless which the Potentiometers had worn out in only 3 months. It looks incredibly good, and works just as good. The LCD screen helped a bit, but there is not much time to look at it while you're flying. I'm doing a profile for Lock On this very moment, and I hope it works as good as it did in FS2004. The second best joystick aside from the flight joke. when i bought this i was instantly amazed by the sheer number of buttons and how many hats (who needs 3 hat switchs) then if you do run out of buttons there are three modes you can switch between in game. Excellent stick by Saitek. It has a button for everything (and it should for its size!) Nice grips, adjustable levers for different hand sizes, LED's...just awesome. Cons: too many buttons, Prize, size. Pros: Very comfortable and great selection of buttons, love the LCD screen. Cons: Expensive, and don't quite like the profiler. An incredible product, just like everything else from Saitek. This is more than a joystick. I like how it can be programmed for several different games, but the profiling software itself, I find can give me problems. Sometimes if I've opened Flight Simulator, and spent 15 minutes programming an FMC flight plan, and then realising the profiler has crashed, meaning I have to restart my computer, can get quite annoying. Other than that, it's a great choice. Occasionally the throttle quadrant crackles a bit, but other than that, it's silent and very nice for flight sim. Top product!